Welcome to 7506 Eric Edward Way. 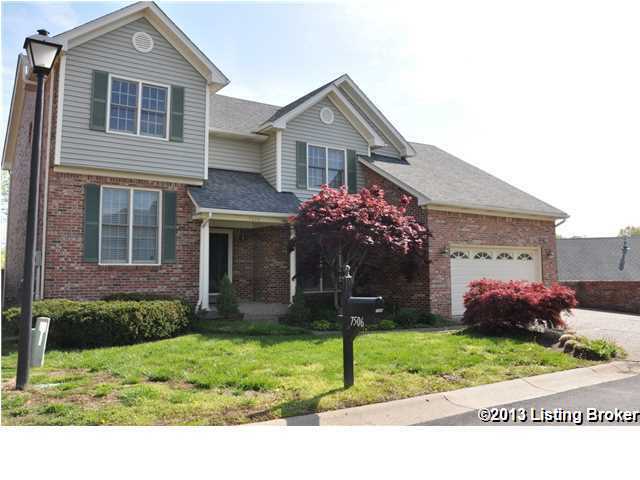 This 4 bedroom, 2 full and 2 half bath home features a unique floor plan. Numerous upgrades throughout to include hardwood floors, ceramic tile, granite counter tops, vaulted ceilings, marble fireplace and much more! The master bedroom features a private luxurious bath and walk-in closet. The walkout basement includes another family room, wet bar, a workout space, and lots of storage. The open wooden deck and screened in porch overlook the large backyard with wooden privacy fence. Great location and neighborhood has a community pool and clubhouse. Call for a showing today! Bradford Grove is a subdivision within the city of Louisville, Kentucky. There are currently 0 Homes for Sale within Bradford Grove, with asking prices ranging from $0 to $0. The average list price per square foot of the available inventory in Bradford Grove is $0, which is the Louisville average of $157. The Average Sales price of all sold real estate in this subdivision for the past year is $237,667. Recent comparable homes have been selling for 98.47% of their asking price. Waterfront homes represent of the available Bradford Grove inventory. The population of Louisville, according to the 2010 Census, is 597,337. The total number of households in the zip code of Bradford Grove is 14,512, with an average household size for of 2.23 people. The total number of renter households within the zip code of 40220 is 5,216, which means that 64.06% of households in this zipcode are owner occupant households. 7506 Eric Edward Way, Louisville KY 40220 is a Home, with 4 bedrooms which is recently sold, it has 3,757 sqft, 0 sized lot, and 2 Car Garage,Attached,Entry Front parking. A comparable Other, has bedrooms and 0 baths, it was built in and is located at and for sale by its owner at $ 0. This home is located in the city of , in zip code , this County Other, it is in the Subdivision, and Stony Brook Woods are nearby neighborhoods.